This section contains taped recordings I did with local UFO witnesses over the past 20+ years, each describing their account in great detail. Below is a series of links to other audio archives that I felt should be preserved elsewhere other than where they originated from. outfits while the fifth one was dressed in a black outfit. October 4, 1967; July 12, 1968 and June 18, 1970.
of hybrid child seen onboard a UFO during an abduction episode. 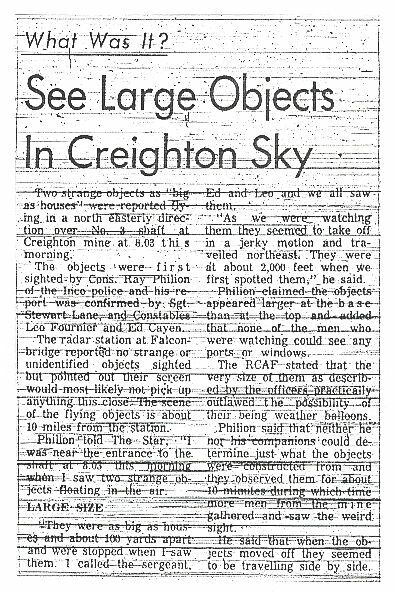 In July 1993, I interviewed two former INCO policemen who witnessed a daytime sighting of two flying saucers over Creighton #3 shaft on September 15, 1961. In September 1993, I interviewed Diana, a resident from Espanola who had a UFO sighting near Chapleau when she was a little girl. 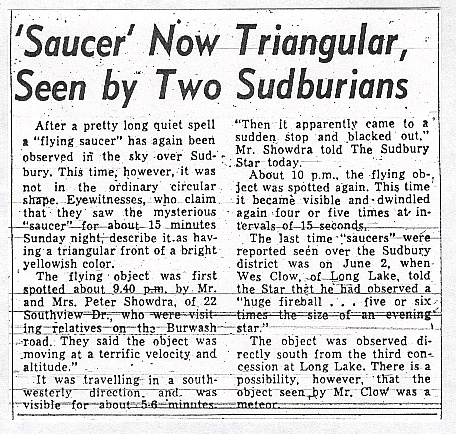 In November 1993, I interviewed Mrs. Shirley Scott, a teacher from Lasalle Secondary High School here in Sudbury, who had an encounter with a saucer-shaped UFO in 1968. 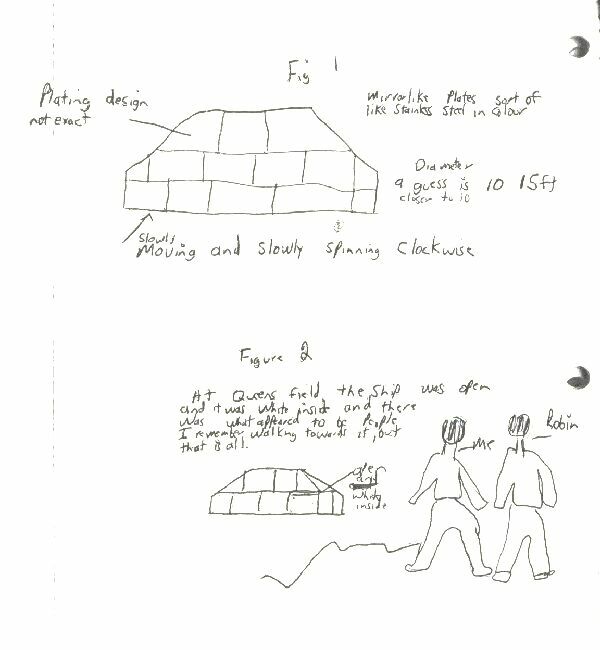 In August 1994, I interviewed a Sudbury resident who had a couple of UFO encounters, including a landing and subsequent abduction at Queen's Athletic Field in the mid 1970s. Sketch made by witness of the encounter he had. 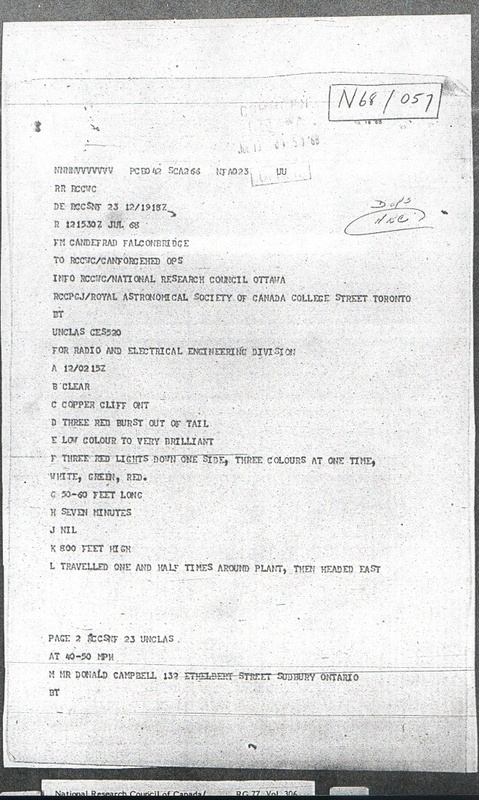 In November 1994, I interviewed a former Falconbridge worker by the name of Vincent Hickey who had four separate UFO sightings near Chelmsford, in the 1970s and early 1980s. 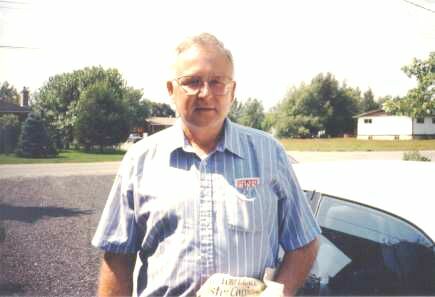 In February 1995, I interviewed Mike Dubé, a former auto mechanic who had an amazing UFO sighting along Radar Road on the evening of January 15, 1995. 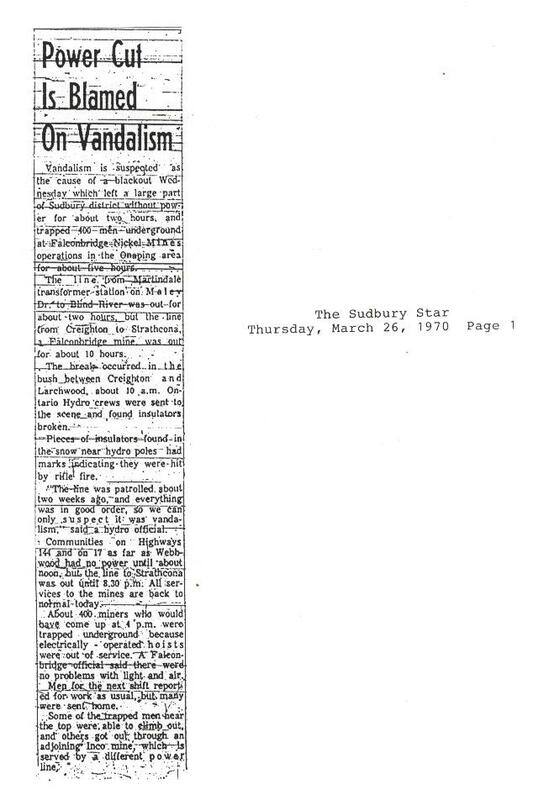 In March 1995, I interviewed a Sudbury resident by the name of Mark V. who reported he had a daytime sighting of a UFO in the downtown area. 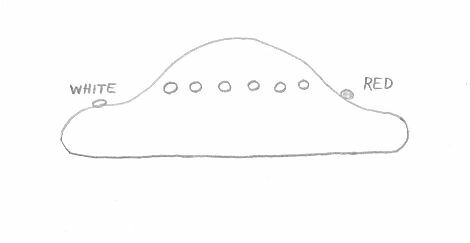 On March 23, 1997, I interviewed a former INCO worker by the name of Ed Davies who had a close encounter with a UFO near Winhapitae, on November 11, 1975. 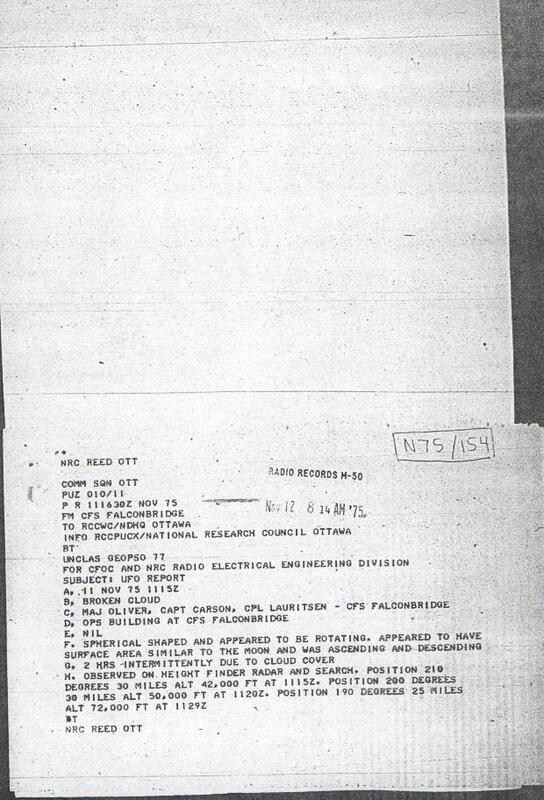 Ed also told me of a sighting that his friend had, of a plane being followed by a blimp-shaped object. 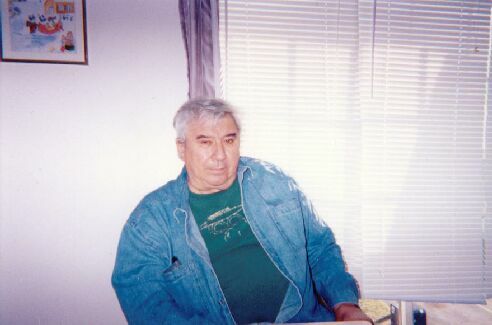 On December 8, 1997, I interviewed Jim Bett, a former heavy machinery equipment operator at Levack Mine, who had an encounter with a UFO on October 23, 1975. 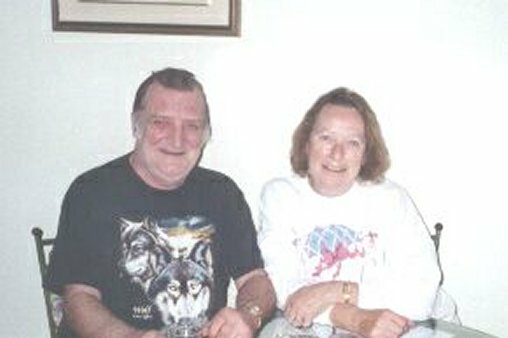 On September 14, 1998, Bev Simms and her boyfriend Mike Dubé came over to tell me of the additional sightings they had, together...and separately. 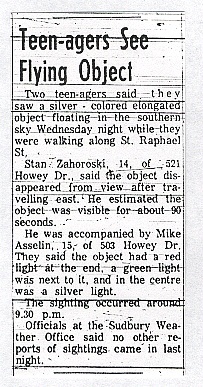 On September 26, 1998, I visited with Sudbury resident Steven Reid, who described a few UFO sightings to me. 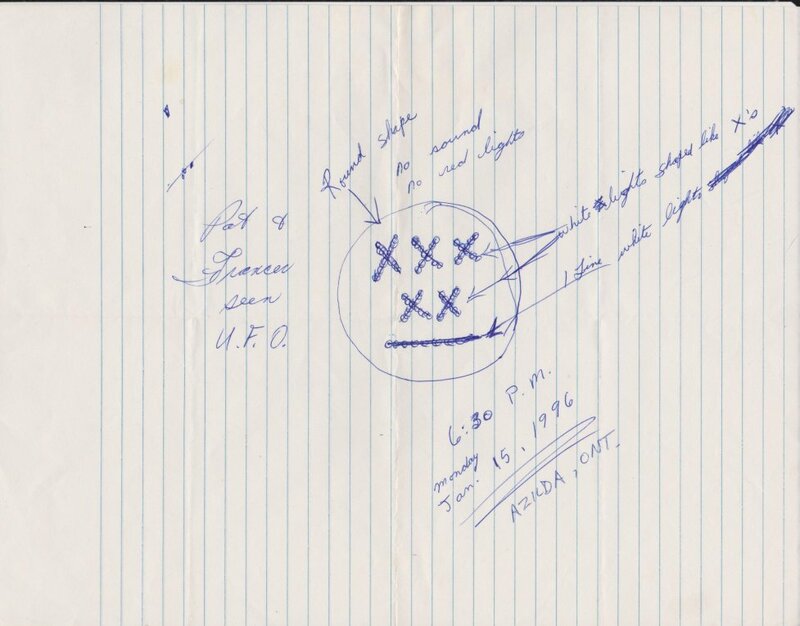 On August 23, 1999, a former Falconbridge worker by the name of Conrad Groulx related to me several UFO sightings that he witnessed himself, as well as other reports given to him by co-workers. 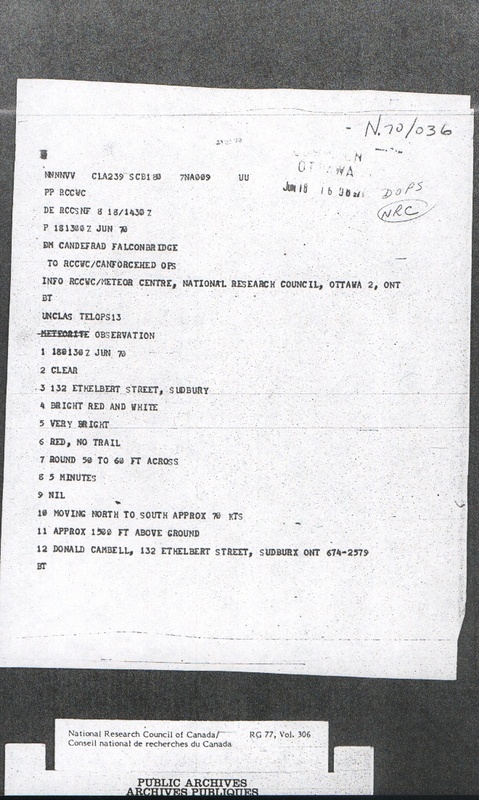 On August 23, 1999, a local resident by the name of Ted Williams called me to report that he saw a bright white cigar-shaped object that disappeared in the plume of the smoke stack at Copper Cliff. 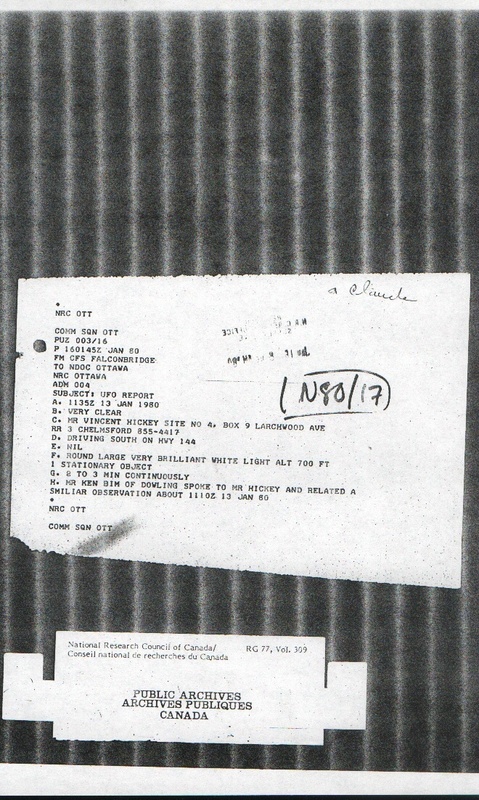 On August 23, 1999, I received a call from Walter Rossmann who reported that he saw a star-like object that got very bright and large, moved south, got dim, then disappear among the stars. 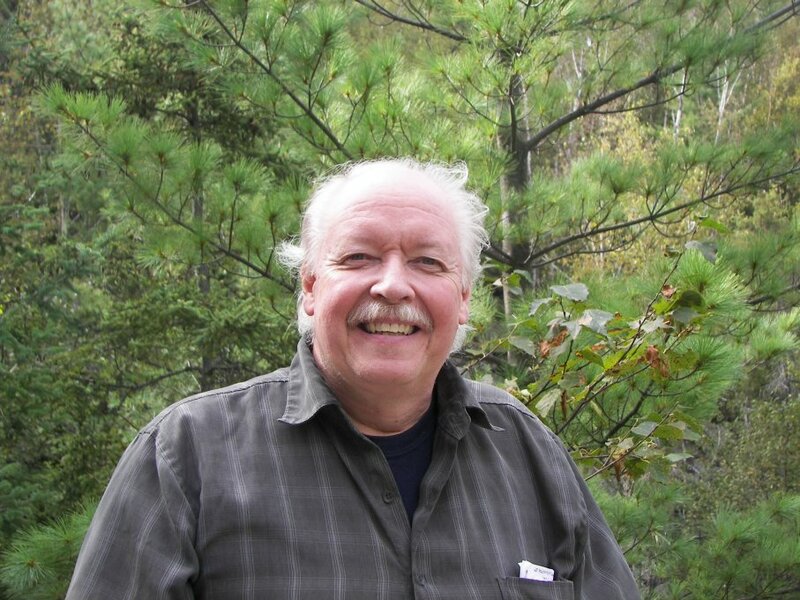 On September 4, 1999, Frank Langemann reported that about four or five years before, while patrolling a tailings area and checking the pipeline, he saw a bright light that came straight down behind some hills. On September 6, 1999, a lady by the name of Sandy called to report that she saw a silver ball-shaped object that shrunk in size and quickly moved away in the sky! The sighting took place in August 1998. On September 23, 1999, Carol B., a local hypnotherapist, describes the sighting she had of an unusually bright "star". 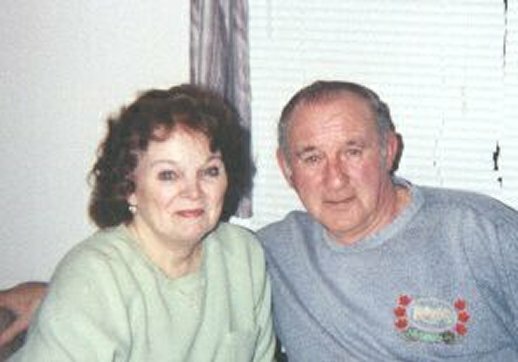 On October 9, 1999, I interviewed Peter Showdra who had a sighting in the summer of 1940, and another in September 1954. On November 15, 1999, I received a call from a Mrs. Ethel Lubinski of Mississauga who related some sightings she and her family had witnessed in the past. 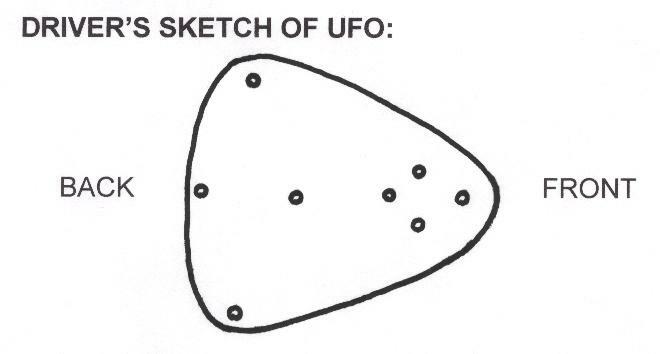 On November 16, 1999, I received a call from Stuart Doran, a Sudbury Regional Police officer who reported a UFO sighting he had in late August 1995 while in the company of his wife. 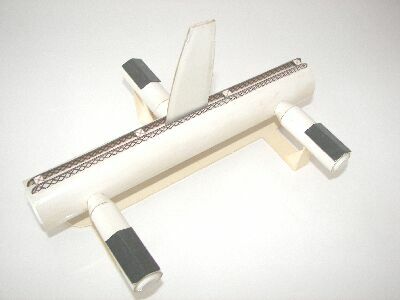 He also filed an official report with the Department of Transport at the Sudbury Airport. 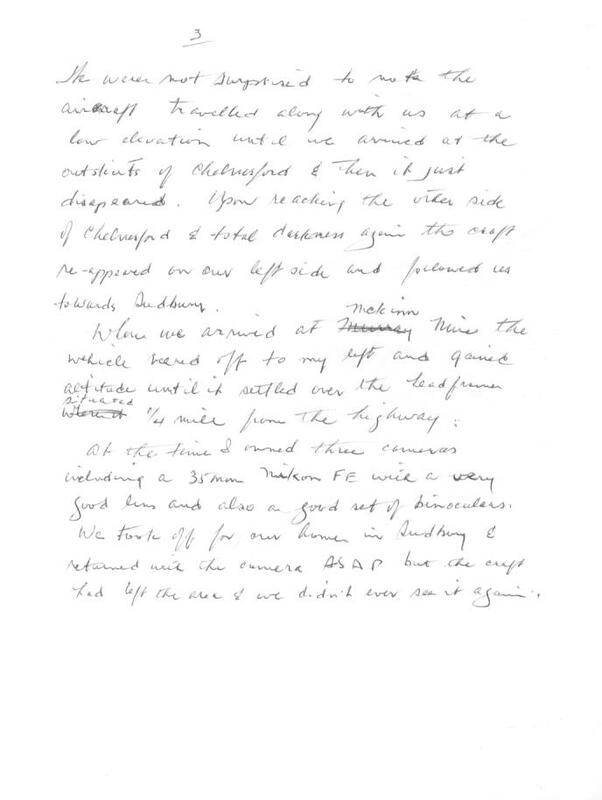 Again, on November 16, 1999, I collected a UFO report from Dean Jacobs who had sighted an object near Dill Lake Road in 1975, at the age of seven. 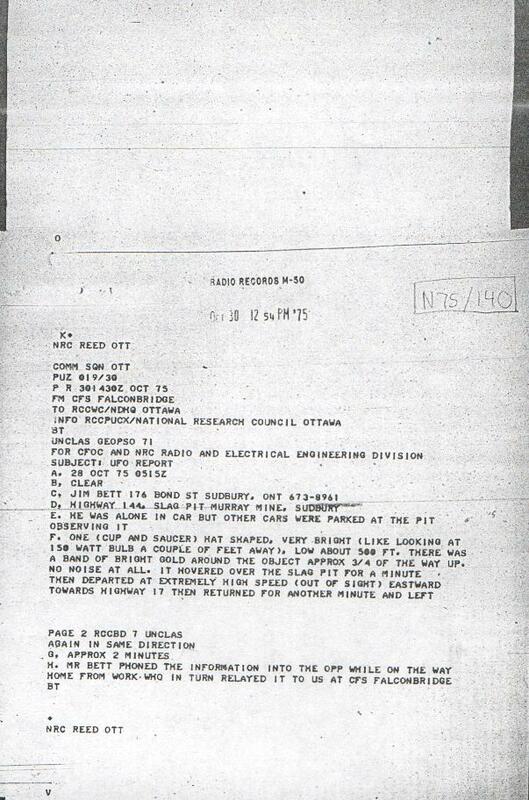 I received another call on November 16, 1999; this time from a Sudbury resident we'll call H. B. who described a near-collision between a UFO and a car she was riding in, near Sault Ste Marie, back in March of that year! 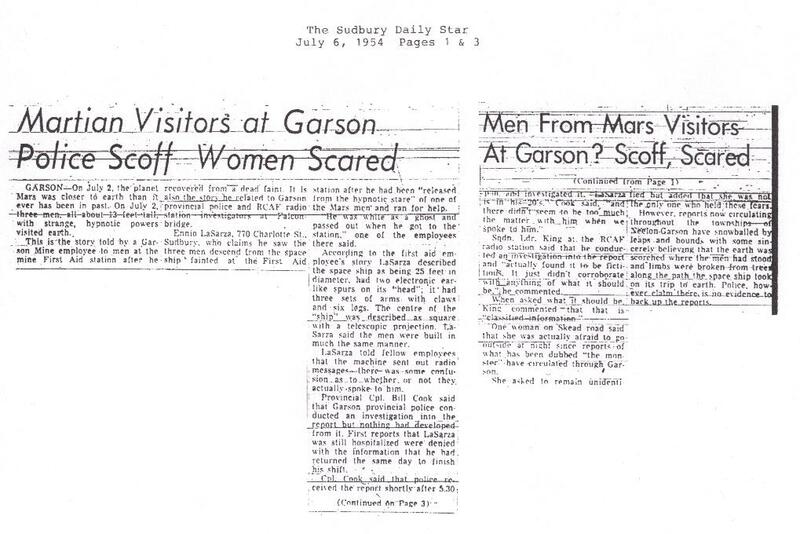 Date unknown: I received a call from someone who related a story he heard from his former co-worker whose brother-in-law was a flight engineer aboard one of the planes that carried wreckage from the Roswell crash, back in July 1947! On November 16, 1999, I received a call from Ambrose Pothier, a former Falconbridge plate worker welder, who describes an unusual experience. 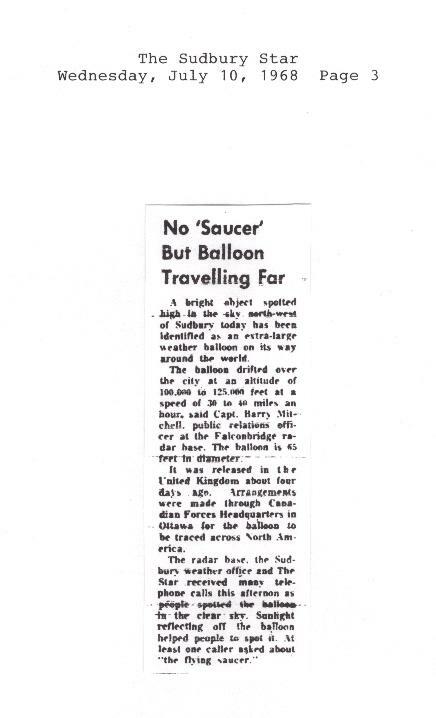 On March 1, 2000, a lady by the name of Isabelle Beauchamps called me to report a UFO sighting and possible landing that took place in either the 1960s or 1970s. She and her husband saw a burnt circle on the ground. 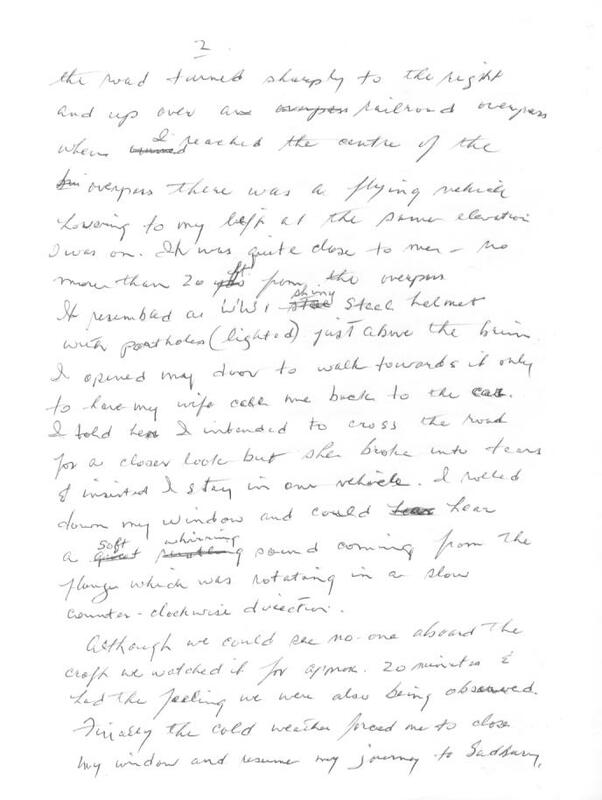 In March 2000, a man named James Clark called to report a UFO sighting he had on August 28, 1997, near Winahpitae, on Dryden road. In May 2000, I was contacted by Paul Eckoff who reported seeing a cluster of lights maneuvering above a tailings pond, sometime during the previous month. 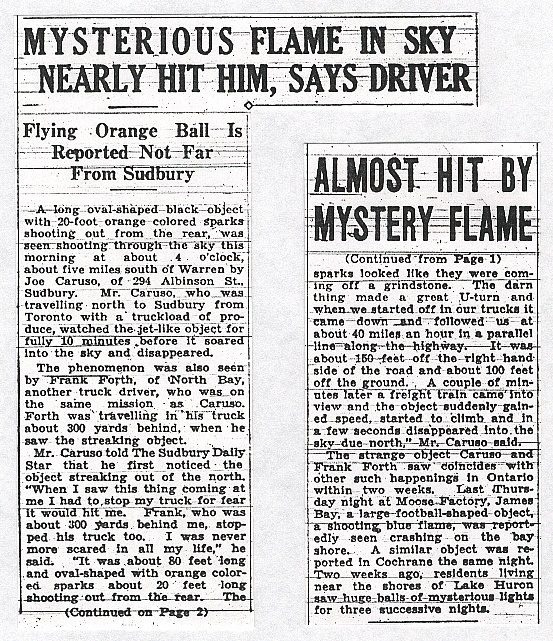 On July 16, 2000, I spoke with two gentlemen who reported a large triangular object that flew over their truck, as they were coming back from camp, some miles from Mattawa, Ontario. On July 25, 2000, I received a call from my friend, Vincent Hickey who wanted to report a UFO sighting he witnessed from his backyard. 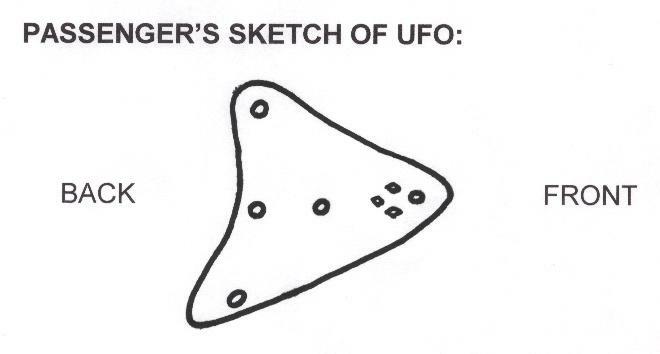 On August 7, 2000, I spoke with a Capreol resident who had seen UFOs, including a large triangular object with lights maneuver over her house. 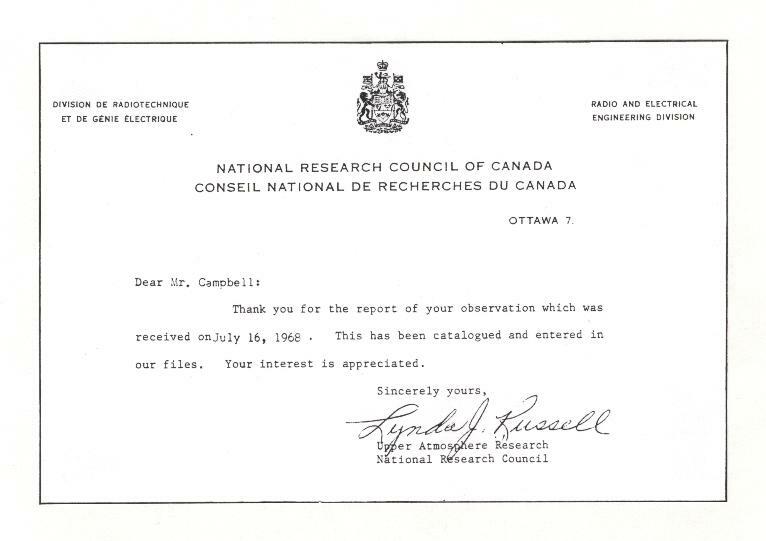 On August 30, 2000, I received a call from Conrad Groulx, former Falconbridge worker who had previously called me to report other UFO sightings. On April 29, 2001, I interviewed a former Sudbury nurse (we'll call her P. C.) who resides in Barrie. 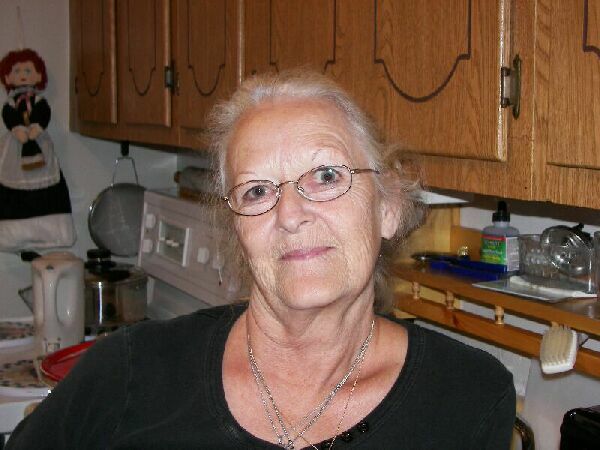 She reported several instances where she saw UFOs in the Sudbury area, as well as an encounter with a tall being near Elgin street, when she was a teenager in the 1950s. 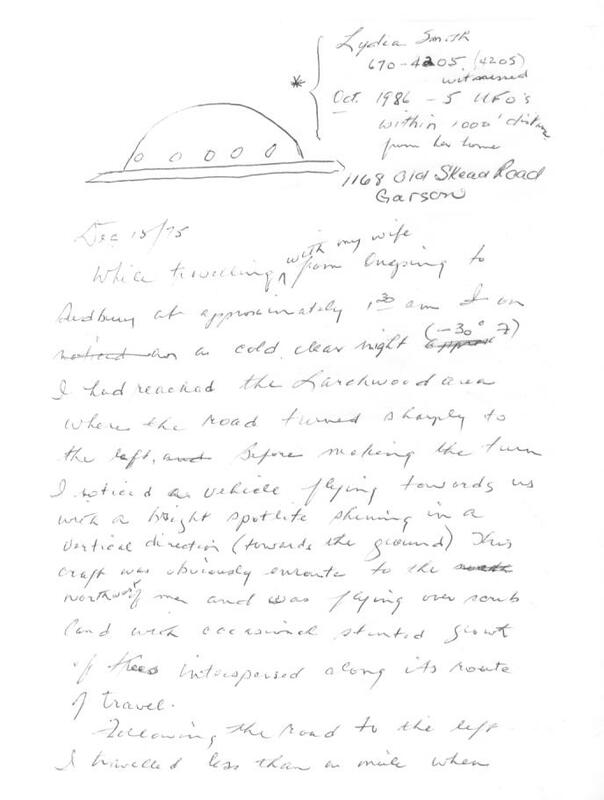 On October 27, 2003, I spoke with a man by the name of Buck Barley, who related a few UFO sightings, one of which was confirmed by two of his daughters. It also happens that Mr. Barley is a pilot. On January 19, 2004, I interviewed Tom Henry, a retired Justice of the Peace, former pilot and locomotive engineer for CNR. 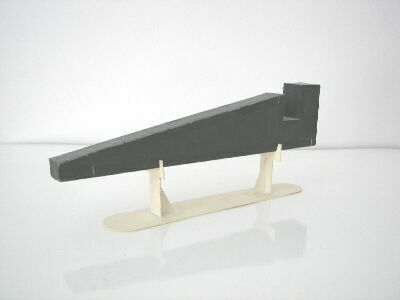 He also raced cars, motorcycles and snow machines in his younger days! 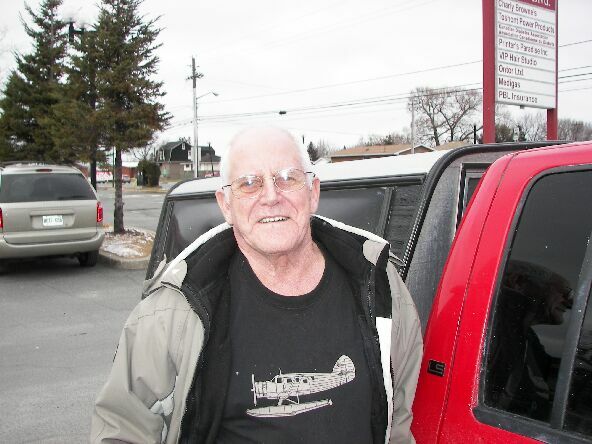 He related to me a few unusual sightings he had during his life in Thunder Bay. 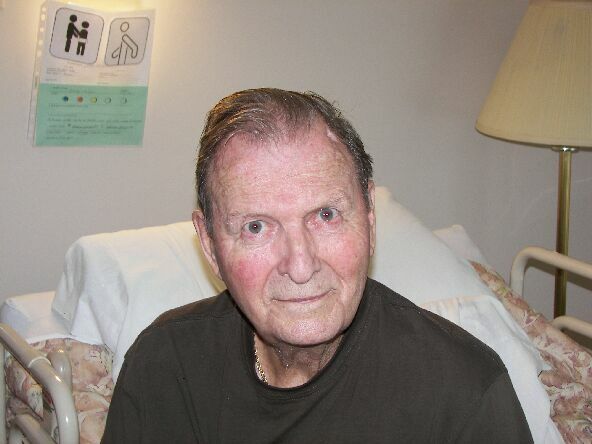 On March 13, 2005, I interviewed Glen Boyce, a former Falconbridge worker whose name had been given to me by Vincent Hickey. Glen relates a few unusual reports. 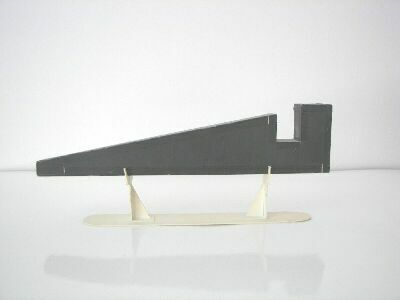 Le mercredi, 10 novembre 2008, j'ai fait une entrevue avec Violette Rivard qui m'a décrit quelques unes de ses experiences avec des soucoupes volantes et leurs occupants. 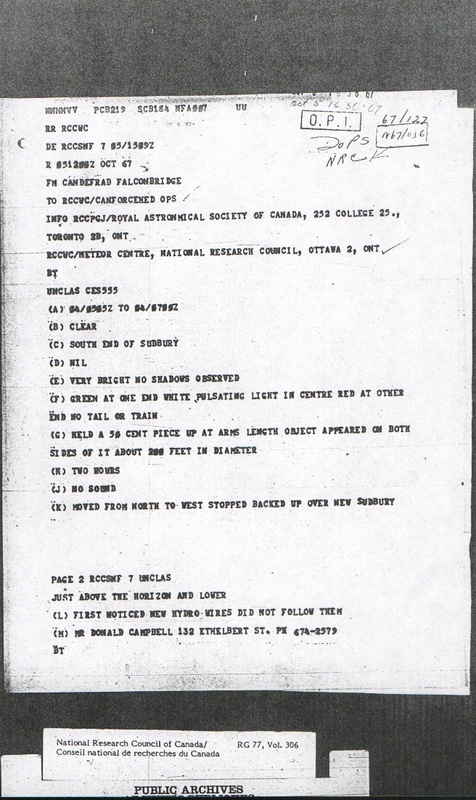 On November 11, 1975, a large, unknown target was picked up on two separate radar sets while four other objects maneuvered over the city of Sudbury. 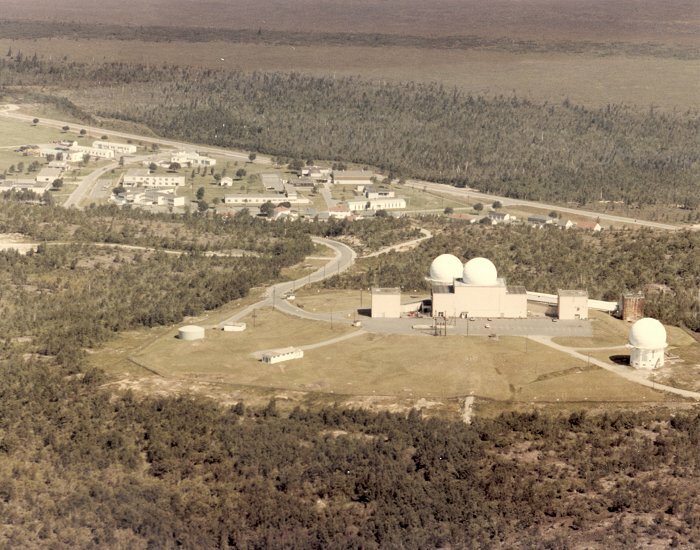 In the following telephone interview, Leif Lauritsen describes what he saw while on duty as a radar technician at Canadian Forces Station Falconbridge. 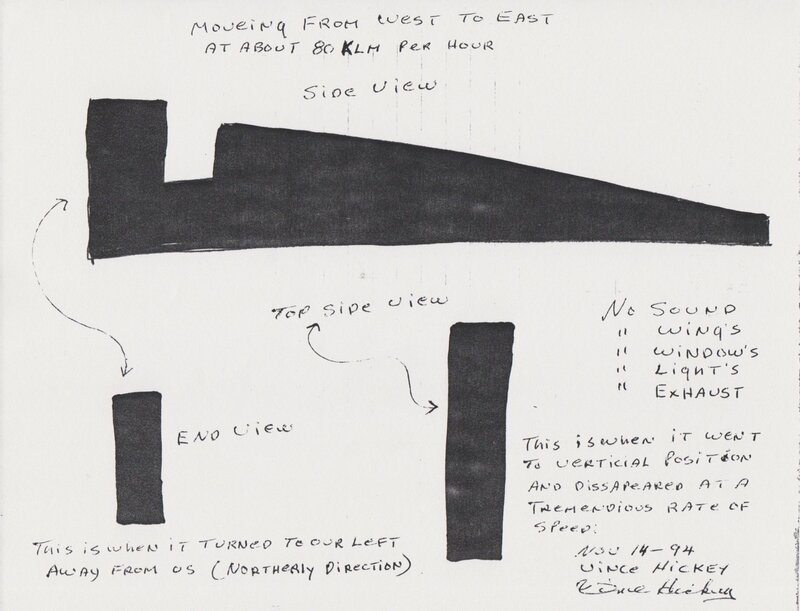 On December 15, 1975, Mr. Don Mulligan and his late wife encountered an unusual object as they traveled from Dowling to Chelmsford. 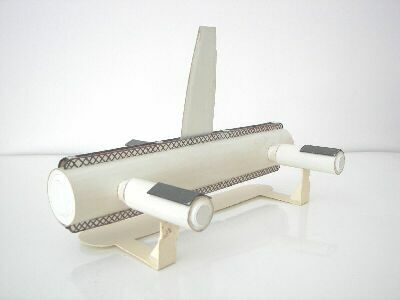 The craft was shaped like a WWI helmet, with several portholes around its side and a flange rotating counter-clockwise with an accompanying whirring sound. Despite his wife's insistence that he stay in the car, he got out and stood within 20 feet of this object. On Friday, July 26, 2013, I met with Jason Caruso, grandson of Joseph Caruso, who revealed additional details about his grandfather's UFO encounter in March 1948. On June 20, 2013, I interviewed both Bruce Roach and his mom Frances while visiting her in Azilda, where she resides. 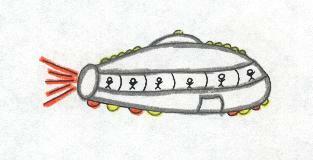 She and her neighbours have witnessed a few UFO sightings of their own. 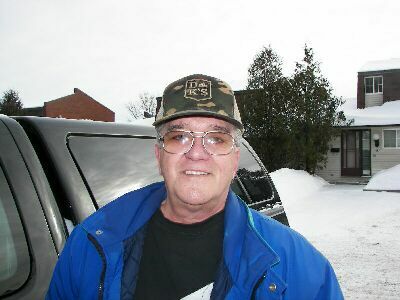 Bruce resides near Lake Simco and his other passion is investigating hauntings and reports of ghosts and spirits. 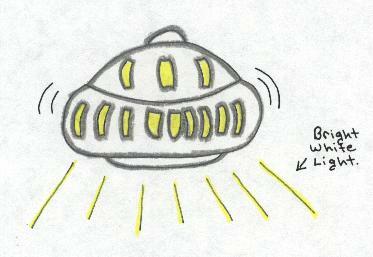 Sketch of the underside of the UFO that flew over Bruce's mom's car. 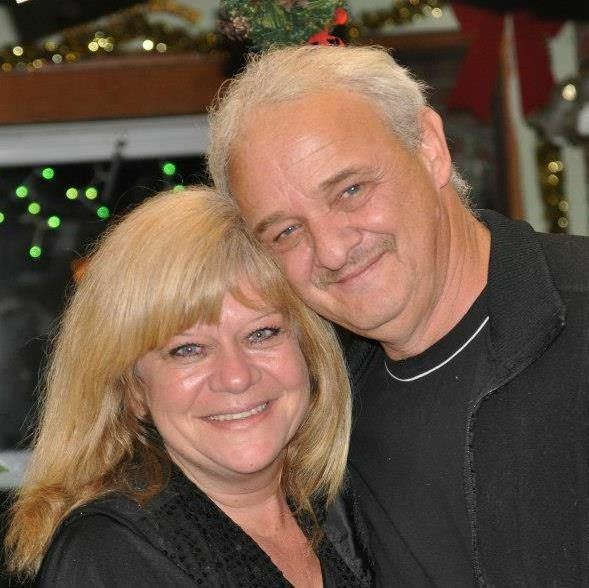 On Friday, September 6, 2013, I interviewed Robert and Linda Cheff about their individual UFO sightings which took place a few years ago when they lived in Cochrane, Ontario. They now reside in the Sudbury area. 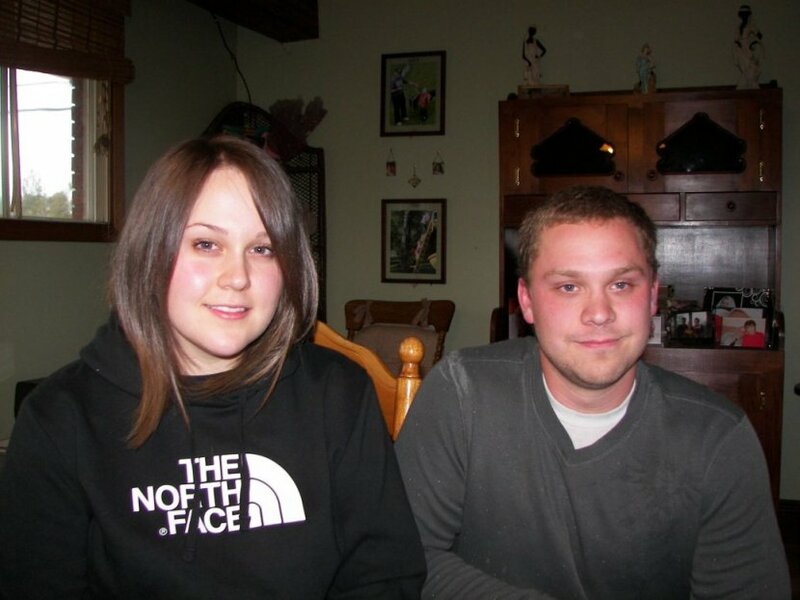 I also interviewed their children, Amy and Josh, who also had their own UFO sightings - both here and near Timmins, Ontario. No infringement intended. For educational purposes only.